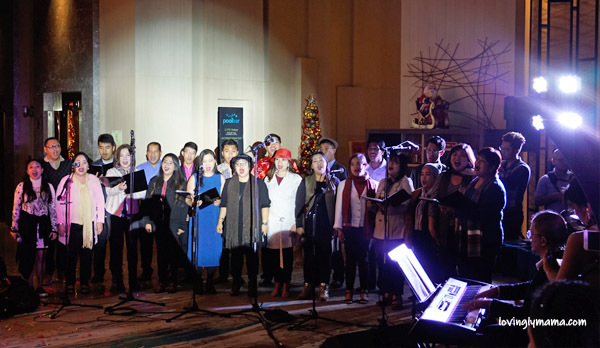 The Courtyard by Marriott Iloilo held its first ever Christmas tree lighting ceremony on November 22. It coincides with the celebration of Thanksgiving Day in the USA. It’s theme, Coming Back Home for Christmas, ignites a deep longing in everyone’s hearts. 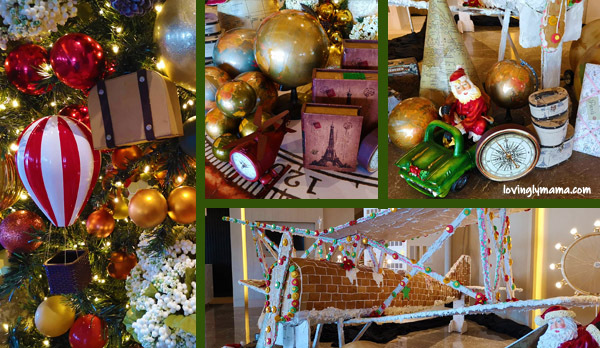 The colorful and glittery travel-themed Christmas display at the Courtyard by the Marriott Hotel Iloilo. The digital age has made the world smaller because we can connect with anyone, anytime at our convenience. We can send and receive messages as well as talk face to face in real time through the internet. But somehow, wherever our dreams may lead us, we still all have that longing to spend Christmas with our families back home. It still feels different when you can hug, laugh, cry, share family meals, and talk endlessly in person. 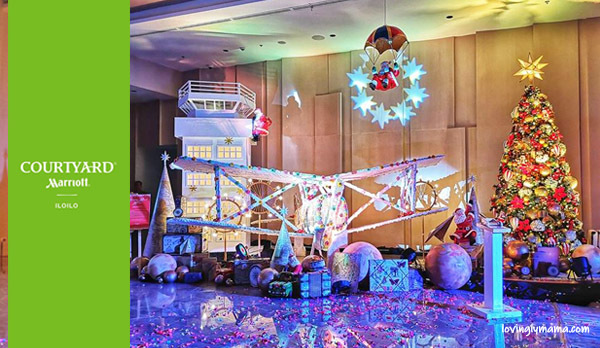 With this in mind, the Courtyard by Marriott Iloilo aptly themed its 2018 holiday display as Coming Back Home for Christmas. It’s a uniquely themed Christmas arrangement with family travel as its central theme. The Courtyard by Marriott Iloilo stands proudly at the Iloilo Business Park in Mandurriao, Iloilo City. This is a significant fact because the Iloilo Business Park was formerly the site of the old Iloilo Airport. And right across the entrance of this new Iloilo hotel is the old airport watch tower. 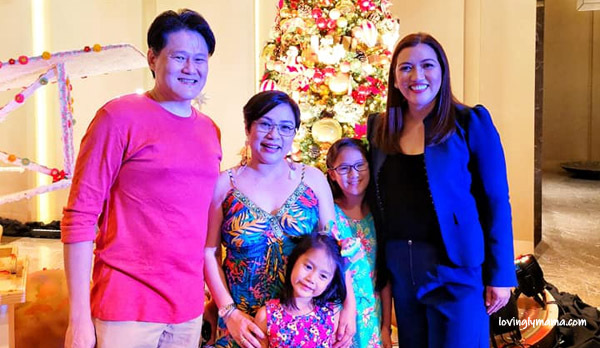 Ms. Cleofe Albiso, General Manager of Courtyard by Marriott Iloilo, started the holiday celebration in the hotel with an invitation to be with our loved ones this season. These are the people who matter most to us–our family. 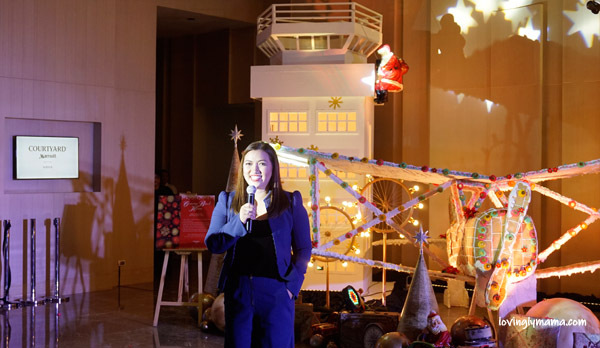 Ms. Cleofe Albiso, GM of Courtyard by Marriott Iloilo, encourages everyone to come back home to their families for Christmas. The spacious lobby of the hotel is dressed up in holiday colors like gold, copper, and crimson red. Every nook and cranny is adorned with globes, compasses, vintage bags, and other travel paraphernalia. The big Christmas tree stands on top of a compass rug. Aside from the fully-decked Christmas tree that stood on a compass rug, the main feature of the display is the gingerbread plane. 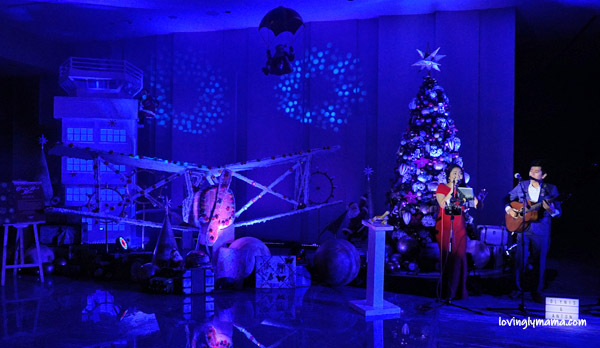 The plane was painstakingly made by the hotel staff and it looks awesome! There is also a 13-foot replica of the old airport watch tower where Santa Claus is climbing down from! How witty! Some of the details of the Christmas display. All these elements speak to everyone of coming back home for Christmas. Upon the arrival of guests, they were served with cocktails while being serenade by acoustic duo, Glynis and Anton from Cebu. Glynis and Anton wowed the audience with their melodious singing before the program started. Ballerinas from the SF School of Dance. Then ballerinas from the SF School of Dance performed a classic ballet dance, which is an excerpt from Tchaikovsky’s Eugene Onegin. 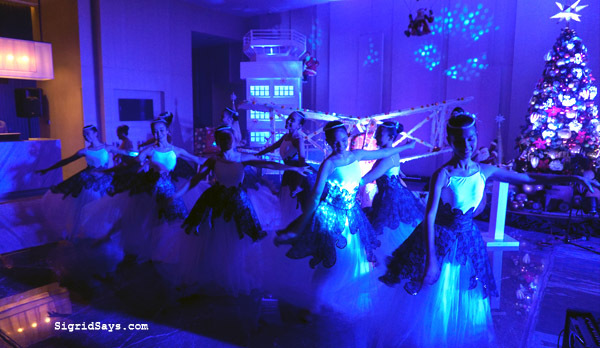 With the Christmas backdrop and the lighting, the ballerinas looked dreamy, like the snow fairies from the Nutcracker. The Christmas tree lighting ceremony. 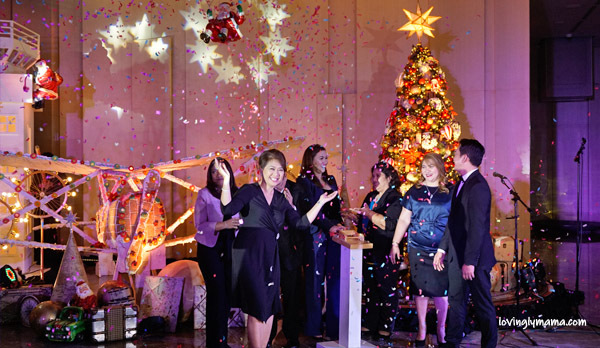 The highlight of the event was the Christmas tree lighting ceremony, which was headed by Iloilo Mayor Jose Espinosa. 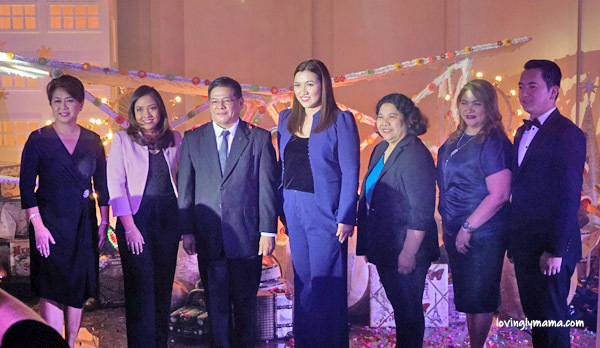 He was assisted by the executives of the Courtyard, namely: GM Cleofe Albiso, HR Manager Frances Siongco, Director of Operations Maia Israel, Director of Sales Joy Alonte, and Asst. Dir. of Finance Marlon Galo. 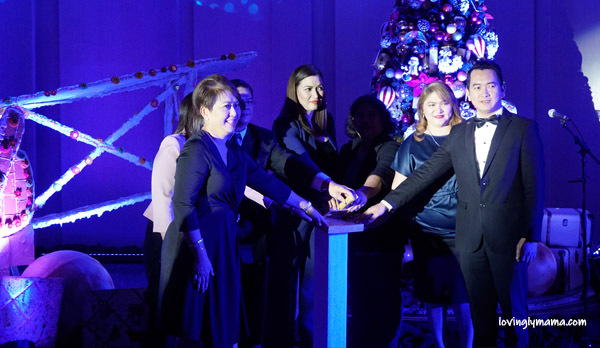 Iloilo Mayor Jose Espinosa with the executives of the Courtyard by Marriott Iloilo during the tree lighting ceremony. Afterwards, the guests were treated to a mini concert by the Sta. Maria Parish Grand Choir. They grandly performed Christmas carols that gave us goosebumps. Meanwhile, Marketing Communications Manager Nico Velasquez also sang a number with them. The Sta. maria Parish Grand Choir. 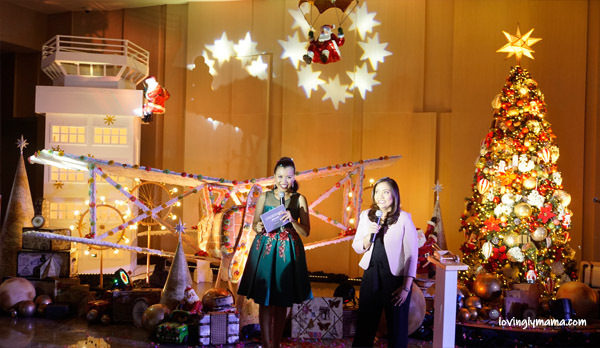 Director of Operations Maia Israel invited everyone to spend their holidays at the Courtyard by Marriott Iloilo. This will save a lot of busy families from preparing their ideal Christmas spread. Ms. Maia Israel, Director of Operations, invites everyone to spend their special Christmas events at the Courtyard by Marriott Iloilo. We love traveling as a family. That is why big part of our family budget is allocated to our travel savings. Read more about how we do it here: Why Travel Savings is a Must for Families. Our homeschooling family is just so excited with this setup. Our wanderlust is further ignited here. We are a traveling family because we believe that the world is their classroom. We are a homeschooling family. My husband and I believe that the world is our classroom. We learn so many things about the world and ourselves while traveling together. It can be stressful, but it’s fun. Mommy Sigrid and family with GM Cleofe Albiso. 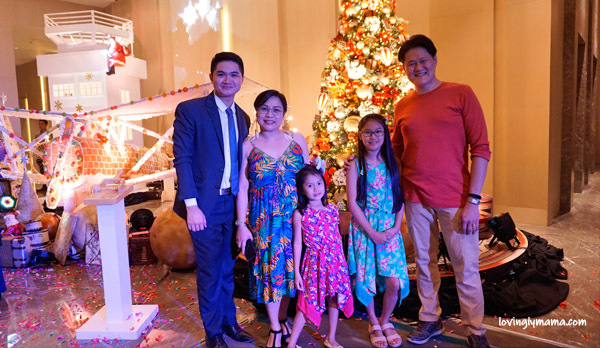 Our family with Marketing Communications Manager Nico Velasquez. 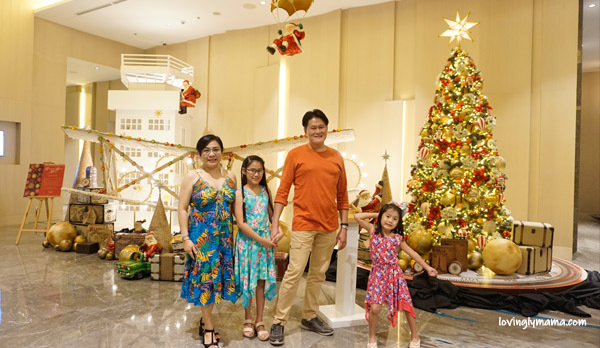 At Courtyard by Marriott Iloilo, coming back home for Christmas has just been made easier and more memorable. It sounds like you all had a great time filled with entertainment and atmosphere. I have never been to the Philippines and look forward adding to my must see list. If ever I get to pass by Iloilo City, I will surely stay at the Courtyard by Marriott Iloilo. It’s a Marriott hotel after all. This post is really awesome. I loved your thoughts about family and coming back home for the holidays. I like the way you have presented it and I do miss my family. By the way, those Christmas tree and decors at the Courtyard are amazing! This is so good that I am lost for words. This is really an awesome experience for all of you guys. 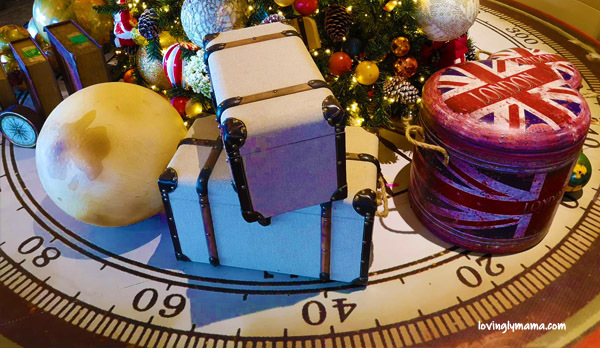 The travel-themed Christmas decors of Courtyard by Marriott hotel is simply spectacular. I must say wow.. This looks like a wonderful holiday event. You seemed like you all had a great time at the Courtyard by Marriott Iloilo! Thanks for sharing! This looks like quite a celebration! The Courtyard by Marriott Iloilo really put on an amazing show! I love staying at the Courtyard by Marriott. It is a great place to go. The food is always great. Looks like you had a great time. I think that travel is such a great way to teach kids, especially for a homeschooling family like yours. I am sure they have learned a lot. Loving the pictures! It looks like it was a wonderful holiday event and your family thoroughly enjoyed it! I hope you had a great time! Thank you for sharing about your experience at the Courtyard by Marriott Iloilo! What a great event! Everything is so thoughtful and well planned. I love to stay at the Marriott hotels because of their amenities and service that have great things for families of five. The decor is so lovely! Thanks for sharing about Christmas at the Courtyard by Marriott. Great idea to got to the hotel and have your Christmas celebration. I can only imagine that for your kids was magical. Those decors at the Courtyard by Marriott are spectacular. I love bringing a family together especially when you are all spread out. What an epic celebration at the Courtyard by Marriott Iloilo. The decorations are so beautiful. And the best thing is, you had the little kids with you. <3 What great family pictures! Wow, everything looks so amazing. Courtyard by Marriott Iloilo really went all out on this one. That gingerbread plane is awesome! Love the decorations! I am going home for the holidays but will stay my parent’s house. Always a great fun when you have your family to celebrate the holidays. Good for you that you were able to celebrate together at the Courtyard by Marriott Iloilo. Looks like Christmas will be very fun there. Thanks for all the info. Will definitely look forward to staying at Courtyard by Marriott whenever I find myself in Iloilo. I wasn’t aware that the hotel chain is present in this province until this post. haha Now you know. Marriott by Courtyard is not only beautiful, it’s quite affordable and also the food is glorious! When my kids were young, we tried to stay at Marriott hotels whenever we could. But we have never been over Christmas. This looks fabulous and certainly looks like a great family event. Would also like to visit Iloilo someday. Marriott never fails to amaze me. They are such a beautiful hotel, anywhere in the world! Lighting a Christmas tree is one thing that I look forward to every year. It fills my heart with so much joy and everything looks brighter. Courtyard by Marriott in Iloilo really know how to play it up well.